"[Bellini's] expression of certain emotions is as poignant as any in the whole range of art, but it is never ecstatic or excessive; with him sorrow is never desperate, compassion never effeminate, nor does the tenderest affection ever verge on sentimentality"
Scant written evidence exists as to the specifics of Giovanni Bellini's childhood. The sixteenth-century artist and biographer Giorgio Vasari recorded in his book Lives of the Most Excellent Painters, Sculptors and Architects that Bellini was 90 when he died, making 1426 his year of birth. But contemporary art historians believe that it is more likely that he was born a little later, sometime between 1430 and 1432. His parenthood has also been disputed with recent claims being made by art historian Daniel Maze that Jacopo Bellini, long considered his father, was in fact his elder brother. There is no dispute however over the fact that the artist was born in Venice. Jacopo was himself an artist, though now better known thanks to the enduring fame of his more famous sons who were much admired in Venice and indeed all-over northern Italy. As their numerous correspondences attest, Giovanni was close to his brother Gentile, and the two learnt the skills of drawing and painting together under the tutelage of their father. The Bellini brothers benefitted early on from their father's extensive travels throughout Italy, especially Florence and other Tuscan towns which were seeing advances in anatomical studies and perspective. Though Venice was not a seat of learning, the city still gave the young brothers the best of start as artists. It was after all one of the richest and best governed capitals in the world with a seemingly veracious appetite for beautiful and extravagant art. In 1443 Bellini accompanied his father on a working trip to Padua. Whilst there it is likely the impressionable teen-aged boy witnessed the preaching of Saint Bernardino. In the more southern reaches of modern-day Italy there had been a blossoming of humanism and a move away from Christianity, a school of thought to which Jacopo himself had ascribed. Saint Bernardino led a powerful resurgence of religious fervour in the country during the middle of the fifteenth century, often preaching for hours in the open air with eloquence and passion on the virtues of the Christian faith. It is very likely that this was the event that began, what was to be for Giovanni, a lifelong and deep devotion to the Christian faith. Despite having two such promising protégés as sons, Jacopo was keen to expand "his School" and having noticed the precocious talent of the young artist Andrea Mantegna on a visit to Padua in the early 1450s, he promptly arranged the marriage of Mantegna to his daughter Nicolosa. Bellini found himself with a new brother in law and Mantegna was to exert a profound effect on Giovanni's practice. It would seem that the relations between the two were exceedingly amicable, and although Mantegna moved to Mantua in 1460, they continued a productive relationship for the rest of Mantegna's lifetime. In the years before 1460 Bellini's work shows an intensity in religious feeling that seems to be entirely his own. Art historian Roger Fry writing in 1899 describes how Jacopo's religious sketches "treated religious subjects with surprising levity" whereas in the work of his son "the feelings of pity and love are expressed with such frequency and with such intimate intensity" as to make his devotion palpable. It was with the same devotion that he committed himself to mastering the developments in rendering the human figure. Perhaps because of his early life in the university town of Padua, or perhaps because of his more extrovert nature, it makes sense that Mantegna was the one to lead the way for Bellini in this Paduan School of painting. His influence on his brother-in-law is clear when comparing the two men's work before 1460. In addition to his brother-in-law, one sees clear links to the work of the Florentine sculptor and painter Donatello who had spent time in Padua between 1440 and 1450. The influence of the painter Carlo Crivello is also evident in his early work. Crivello was in fact a student of the only other school of painting to the Bellini's in Venice, The Vivarinis. A rivalry grew up between the two schools and this competitiveness acted as a spur for Bellini who took it upon himself to stay abreast of artistic developments beyond Venice. Yet despite this local rivalry, Bellini is also credited with an openness and generosity with other artists. In 1459, Bellini married Ginevra Bocheta. The pair had at least one son, whom they named Alvise. Family life did not seem to dull his desire to excel at his art, however. His growing confidence at this time is clear as he threw off the occasionally austere and self-conscious linear nature of the Paduan School. He still seemed to be drawing inspiration from Mantegna, despite his friend's move to Mantua. But his work from 1460 onward shows definite indications of the grace and elegance unique to his later works. His brother Gentile was considered the greater of the two brothers at this point, but this did not seem to have created enmity between them. In 1470 the brothers, with several other artists, were commissioned to paint works of the Old Testament in the Scuola di San Marco. Bellini produced a painting of The Deluge with Noah's Ark, which was much acclaimed at the time but sadly has not survived to the present day. In 1473 a painter by the name of Antonello di Messina arrived in Venice. The exact reach of the man's travels is unknown, but it is certain he had travelled to Northern Europe, most notably the Netherlands, and that this had had a huge influence on Bellini's work. Significantly di Messina had adopted the Northern European practice of painting in oils and it is widely thought (though sometimes contested) that he was responsible for their arrival in Venice, and throughout Italy subsequently. Bellini begins to paint in oils and the new medium seems to have agreed with his developing elegance and allowed him a subtly in graduating color and atmosphere that were previously impossible to achieve with tempera. It could be argued that this technical advancement marked the beginning of when Bellini really began to settle into his professional stride. 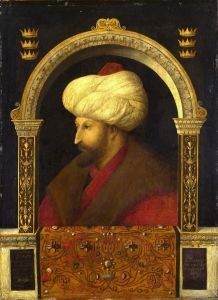 Gentile Bellini, The Sultan Mehmet II (1480) (extensively repainted in the 19th century). 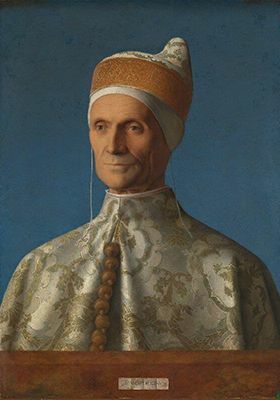 In its “alternative” choice of a progressive three quarter profile, Gentile's painting anticipates his brother's famous portrait of Doge Leonardo Lorodan. 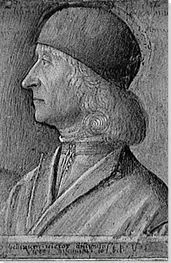 In 1479, Bellini's brother Gentile traveled to Constantinople leaving his post as conservator to the halls of the Doge. Giovanni and Vivarini were jointly appointed to continue the work. During the course of their tenure Vivarini died, however, leaving Giovanni in sole possession of the significant role. Sadly, the substantial amount of work Bellini completed in these halls was lost entirely to fire in 1577. The appointment cemented him as the greatest painter in the city at the time and in 1483 he was appointed official painter of Venice. 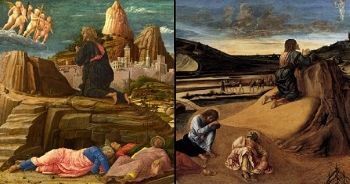 It is during the 1490s and in the first few years of the 1500s that he took on, first Giorgione, and later Titian, as pupils. Both men would go on to make a significant impact on the Venetian Renaissance, and in the process they helped to further secure Bellini's legacy. From 1500 onward, Bellini was overwhelmed with commissions. He was however financially secure and even began to turn away potential patrons. 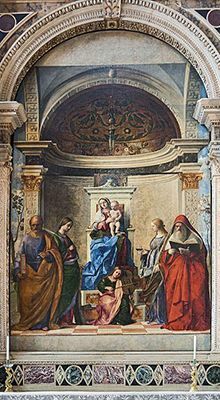 Isabella Gonzaga of Mantua requested a secular scene of ancient Greek myth, a genre of painting also called all 'Antica. This was the second picture she would have received from Bellini, but he declined. 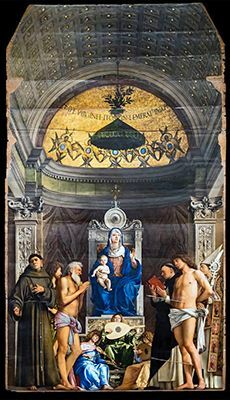 It is often argued that this was because 'Antica pictures Bellini was technically incapable of producing, or that he declined for religious reasons. It is far more likely, however, and fits much better with what is surmised of Bellini's character, that he declined out of respect to his brother in law Mantegna. Mantegna was still court painter to the Gonzagas and specialized in this type of painting and it is highly possible that Bellini simply did not want to encroach on his territory. 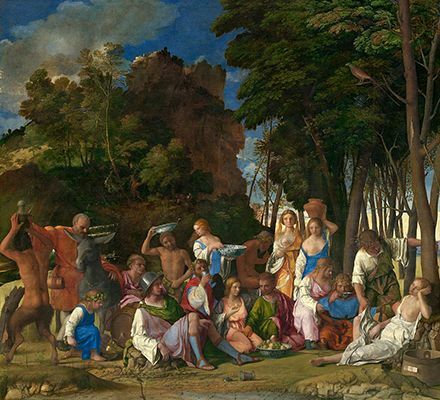 This interpretation is supported but the fact that in 1514, after Mantegna's death, Bellini produced The Feast of The Gods for the Duke of Ferrara, thus proving his technical ability and refuting all alleged religious qualms. 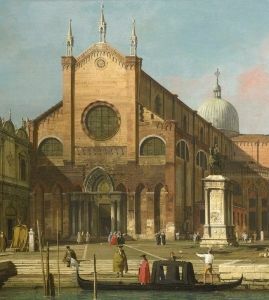 View of San Giovanni e Paolo in Venice as depicted by the Baroque painter Canaletto. His work during the last 16 years of his life bares such refined elegance it is hard to resist the inference that he was a content and accomplished master in his old age. When Albrecht Dürer visited Venice for the second time in 1505, he was scathing about the welcome he received from every artist but Bellini of whom he said, "He is very old but still the greatest artist of them all" (an endorsement that may have had something to do with the fact that Bellini bought one of Durer's paintings on this visit). In 1507 Gentile died ending one of the closest relationships of Bellini's life. Gentile left his brother their father's sketchbook and in return Giovanni completed Gentile's unfinished The Preaching of St Mark. Following his own death in 1516 Giovanni Bellini was honorably buried with his brother in the church of San Giovanni e Paolo, the resting place of the Doges. 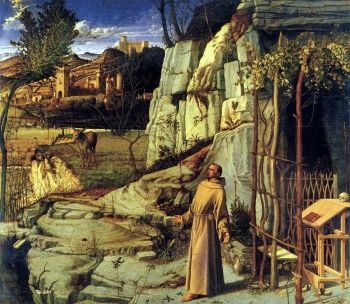 Giovanni Bellini's St. Francis in the Desert (also known as St. Francis in Ecstasy) (c. 1480) is a highlight of the Frick Collection in New York City. 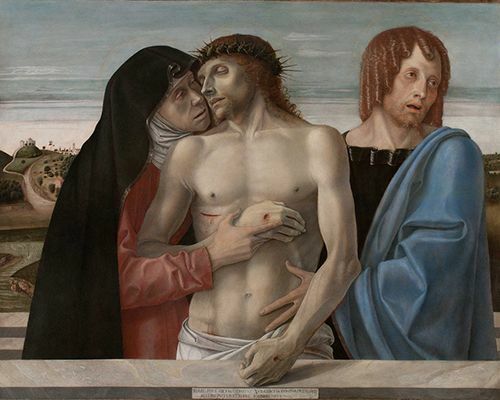 Giovanni Bellini left two major legacies to the art world. First was his skill in bringing a tangible sense of ambience to his painting, and second, the new possibilities he opened up when he imbued religious deities with corporeal qualities. His own achievements were however surpassed by his pupil Titian who became the great colossus of 16th century Venetian art and, towards the end of his career, a forerunner for the more expressive Mannerist style which duly took over from the more naturalistic High Renaissance. Titian took from Bellini his subtle and serene blending of color and light while bringing to it a fresh drama and dynamism. Similarly, as Bellini had learnt much from the Dutch masters, Albrecht Dürer came back from his visits to Venice to infuse his later portraits with a Belliniesque, Venetian hue. And though it was not acknowledged in his own lifetime, Bellini has left his indelible mark on landscape painting which was derided by serious artists of his own time. It was only many centuries after his death that the significance and attention he paid to the details of the natural world received its just recognition. Indeed, a convincing argument can be made for Bellini as the father of landscape painting and it is certain that later painters, such as Albrecht Dürer, were heavily influenced by him in their naturalistic pursuits. 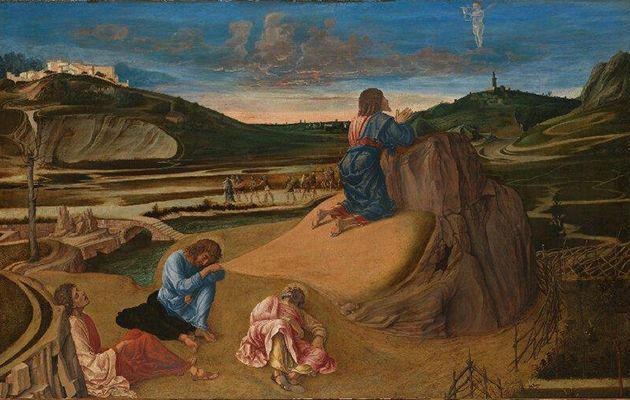 This painting depicts the common religious theme of Christ's time of prayer in the Garden on Gethsemane before being taken prisoner by the Roman soldiers as a result of Judas' betrayal. In this version Christ kneels at a rock mound in prayer, while the disciples, Peter, James and John, sleep on the ground behind him. Visible in the clouds above the kneeling Jesus is an angel, holding aloft a cup and paten as symbols of Christ's sacrifice to come. Beyond these foreground figures, in the distance, winding their way along the road, are the Roman soldiers with Judas in the lead. Bellini's fine religious parable acts also as an excellent example of his respect for the natural landscape.